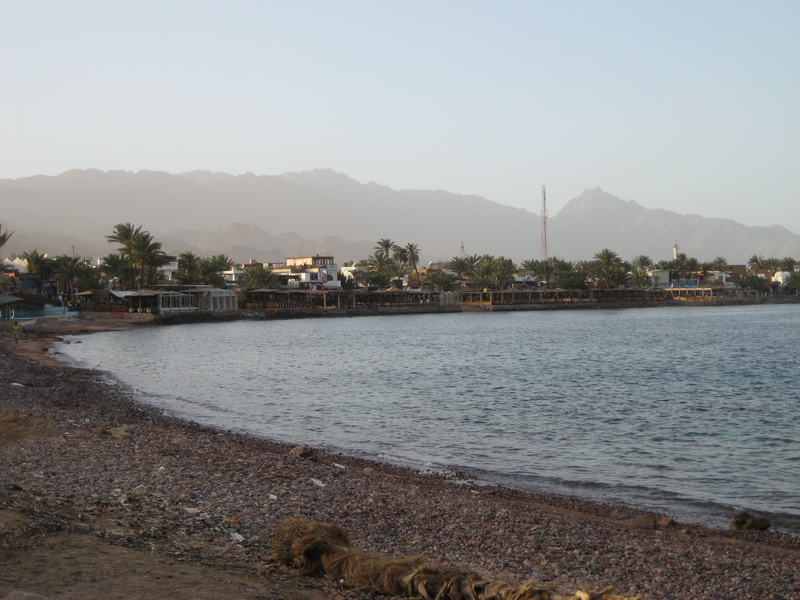 Dahab, on the Gulf of Aqaba, our final stop in Egypt. Lounging, diving, lounging, eating, lounging, reading, … well, you get the picture. But today’s story starts a little further back. Due to a variety of other plans not working out we eventually found ourselves on the sleeper train from Luxor to Cairo. A ten hour trip, but real beds so barely even a hardship. Unless, of course, you count the breakfast, which was simply 4 different types of bread, each individually packaged and all quite disgusting. Even so, no vomiting on this train, which dropped my average all the way down to 50%. 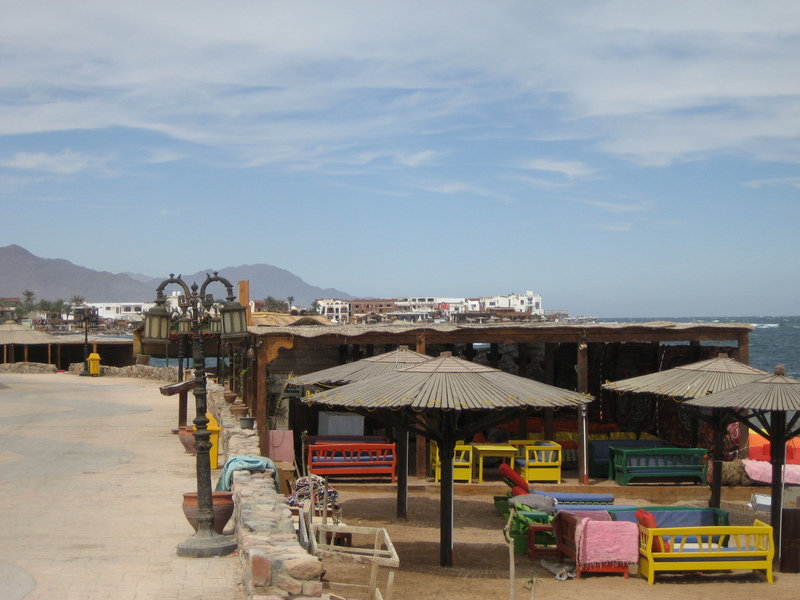 A late train, narrowly missed bus, alternate bus (which took 8.5 hours instead of the supposed 6.5) and we now found ourselves sitting at what passed for a bus station in Sharm el-Sheik at 7 pm, still one hour shy of Dahab, with another bus supposedly coming through in an hour and a half. Hmm. Needless to say, you could have cut our skepticism with a knife. What seemed like an eternity later we were nearly out of Sharm when we suddenly pulled over just short of a police checkpoint. Immediately the sun-shades went up and he reached back, quickly demonstrating to Rachel how she should duck down and pull the jacket over her head to most effectively disappear from view. And if Katie could just hunch a bit, and the three of us sit straight back against the seat that would help too. Did this explain the whole jacket debacle? Somewhat. Was it a reassuring development? Not exactly. Although it turned out to be more a matter of too many people in the car than some insidious plot to dispatch us in the desert somewhere. Which was good. Ah, finally the highway, the open road, beautiful new pavement, hang on folks, this could get pretty crazy. 40 km’hr, 60, 80, 82, …77, 77, ….71, curve coming, 65, 60, brake, gas, brake, brake, gas! Back on the straightaway the gauge creeps upward again before settling in at a dizzying 78, the darkened landscape flying by like we were on, say, Warman Road. The passengers confused glances were repeated each time our speed was reduced by half due to oncoming traffic, a car approaching from behind, a gradual curve or even a particularly dark stretch. Our disbelief must have been obvious the time we slowed to 20 km/hr on a long dark straightaway, no lights or buildings in sight. “School” he explained, at 8pm. 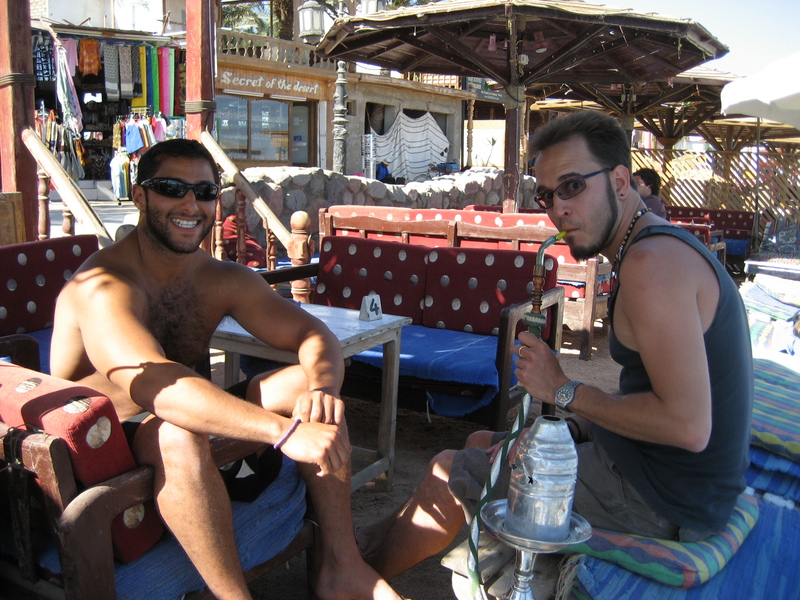 Here we are, though, soaking up what we consider to be well-deserved rest after our hectic journey through the rest of Egypt. We’ve done a few dives, hitting the highlights such as the Canyon and the Blue Hole, but other than that mostly a lot of not much. Met up with Kamin again (he conveniently missed his flight to Europe a couple weeks ago) and several others along the way. Now it’s just a matter of getting geared back up for the road – next stop Jordan.